The Ivan Gren landing ship has arrived in the Russian port of Baltiysk for testing before it goes into service with the Russian navy later this year, Rossiyskaya Gazeta reported. © Sputnik / press service of the company "Baltic Shipyard"
The Ivan Gren landing ship has arrived in the port of Baltiysk in Russia's Kaliningrad region for testing before it joins the Russian fleet later this year, Rossiyskaya Gazeta reported on Monday. 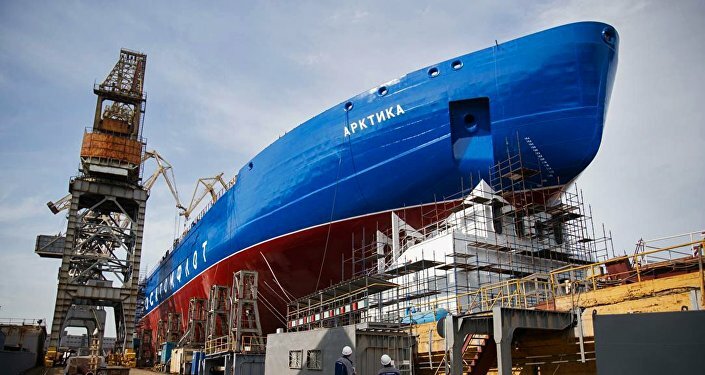 The vessel was the first Project 11711 ship to be launched to water in 2012 after construction at Kaliningrad's Yantar shipyard. Construction of a second landing ship of the same class, Petr Morgunov, began in 2014. Ivan Gren has a water displacement of 6,000 tons, its length is 120 meters and its beam is 16.5 meters. It can carry up to 300 marines, 36 armored transport vehicles or 13 tanks. It is fitted with two Ka-29 naval combat and transport helicopters, and a 30mm automatic cannon. The Russian navy originally planned to commission six of the ships, but last year announced their number will be reduced to two in favor of a new, larger generation of landing ship, which will be able to carry several helicopters. "In the next five years construction will be underway of a new generation of large amphibious warships, larger than Ivan Gren or Petr Morgunov and will be able to carry even more infantry and several helicopters," head of the Russian navy's shipbuilding directorate, 1 rank Captain Vladimir Tryapichnikov told RIA Novosti last year. A source in the Defense Ministry told Lenta.ru that the large landing ships will be similar in design to the Dutch Rotterdam or Johan de Witt amphibious warfare ships. They will have a displacement of 14-16,000 tons, be able to carry 500-600 marines or six helicopters, and landing craft. The source said that the Kaliningrad shipyard will use experience gained from constructing some of the parts for the Mistral-class amphibious assault ships that Russia had ordered from France, before the French government scuppered the deal. "The staff at the Baltic factory learnt everything, they did their part of the work to a really high standard," he said. "The French specialists strictly controlled the production process, and they were very pleased."